Tucked away, but RIGHT across from Haystack it is exactly what we remembered from when we were there a few years ago. This is the most welcome I have ever felt renting a house. It felt like I was coming home. 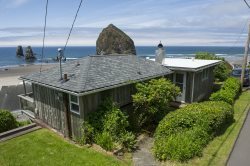 We chose Clark's Cabin because it was close to town, the beach and it was a short walk to Haystack Rock. We enjoyed a get-a-way with my bridge group. We had a great time shopping and walking on the beach. The location was great. The cabin easily accommodated four playing women. The weather was a wonderful bonus but we would've had fun anyway. We were able to cook in when we wanted. But it is a handy walk to stores and restaurants when we wanted to get out. The electric heaters work great in the fireplace was a nice option. I think the website said two blocks to the beach but to us it was just one easy block to easy access. We would eagerly stay there again. All four of us totally love Canon Beach. My aunt said we were going to her favorite place. Our stay at Sona Tra was extremely relaxing and totally enjoyable. We will certainly stay there again . . . and soon. The family all look forward to our annual stay which has been their Christmas gift for 4 years and will be their gift again for 2015! My kind of Christmas shopping! We loved our stay and enjoyed everything thing we go to do. The stay was excellent and the weather was perfect. Best place we have stayed at on our trips so far. We all loved it. Most enjoyable. Could not have ask for more. Support staff and property was outstanding. Well equipped from kitchen to beach activities. Best vacation rental company we've ever worked with - professional, efficient, and friendly, which made renting for our family vacation incredibly easy and non-stressful. Thank you for the thoughtful gift bag as well - dog treats & baggies, coupons, mugs, and coffee beans. We really appreciated and enjoyed it! It was very pleasant and we will most likely stay there again next year, if possible.